Spanish sports journalist and author, Santi García Bustamente, concisely details the legendary values of Real Madrid from A to Z in a dictionary format. He also provides a historical perspective with quotes from many past and present Madrid legends. 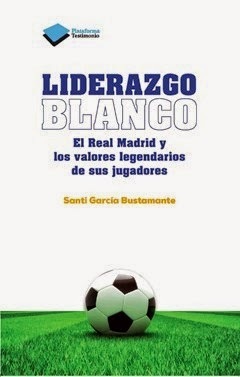 Santi García Bustamante has compiled a must-read for any Real Madrid supporter or fan of Spanish football. The book will also make a useful reference guide for a professional analyst or commentator. Regardless of your background, "Liderazgo Blanco" will improve your appreciation and understanding about one of the largest sporting clubs in the world. "The commitment of the players of Real Madrid is equal to that of the club with its players. I am quite certain that they worry a great deal about them, and not only, as would be logical, in their professional aspect or their form on the pitch. The club also cares about everything that happens in their private lives, of any problems they have or may have, and provides them with help or advice if necessary." --- Iñaki Ereño, Council Delegate of the Sanitas Real Madrid Medical Services, "Liderazgo Blanco. Real Madrid y los valores legendarios de sus jugadores" (Leadership the Real Madrid Way: Real Madrid and the legendary values of its players), page 16, published in 2013 by Plataforma Actual of Barcelona, Spain, with a list price of 15 euro. Santi García Bustamante was also the author of "El Efecto Simeone", (The Simeone Effect) which had a revised version published in 2014 entitled, "Simeone: Partido A Partido," which I have also reviewed. The author's new book analyzes the humane and leadership values of Real Madrid in brilliant detail. Let's take a look at the contents of this intriguing book. There is a prologue, an index, 21 chapters, an acknowledgements page along with a detailed bibliography. 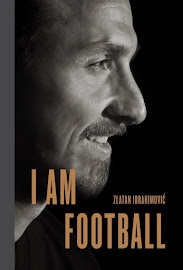 The author chronicled one value for a dictionary letter in the Spanish alphabet and selected a Real Madrid legend to be the focal point of that chapter. This format was an excellent choice both from a humane level along with a historic one. "Di Stefano left his sweat on the pitches that he ran upon." --- Jorge Valdano on page 22. "Bernabeu was like my father. In humane terms, he was an insurmountable person." --- Francisco Gento on page 35. "Raul wore the Real Madrid shirt glued to his skin." --- Fernando Hierro on page 66. "Cristiano mirrors the values of Real Madrid. He converts each day of his life into a new challenge." --- Jorge Valdano on page 73. "Iker is a person who unites." --- Xavi Hernandez on page 94. The author's writing style is journalistic, detailed, engaging and uplifting. Despite the dictionary format, his chapter lengths were short enough to provide concise details about the players and coaches in question. This book is a treasure trove of excellent quotes that are neatly categorized. Professional radio and television commentators would no doubt benefit greatly from the author's research. García Bustamante has created a handbook about Real Madrid which listeners and/or viewers would enjoy due to the amount of historical facts and quotes in one place. Santi García Bustamante (1965, Madrid), is a journalist with Efe Agency, and worked as a sports journalist for a long time. He has attended many sporting events: World Cups in the USA, France, and Japan and Korea; European Cups in England, the Netherlands and Belgium; and the Olympic Games in Barcelona, Atlanta and Sydney. I have received a complimentary review copy from a representative of the publisher, Plataforma Actual. I was not financially compensated by the author, publisher or any party who would benefit from a positive review. 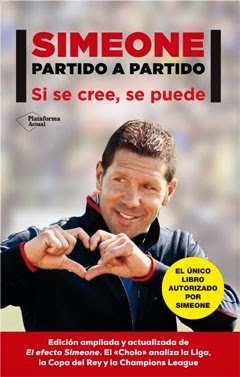 Book Review: "Simeone: Partido A Partido"